Without even being able to read music, you can sense its rhythm. Visually, the graphic nature of a music score conveys pace and movement. 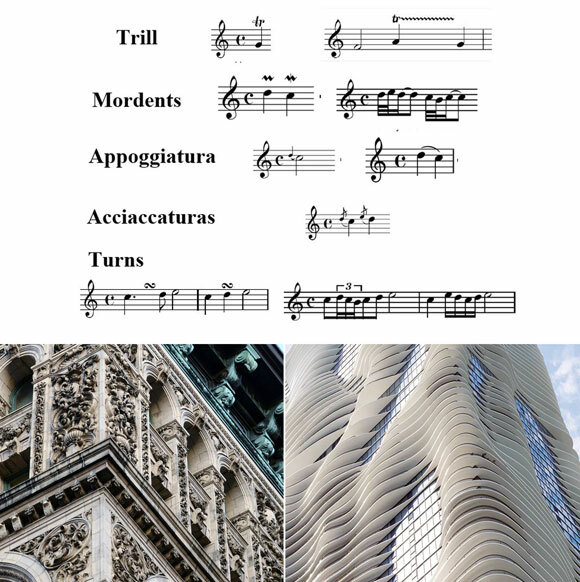 In both music and architecture, rhythm is more than visual. 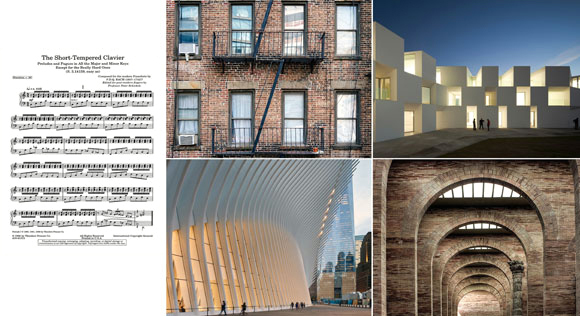 It is experienced physically and spatially as tones and harmonies enter your ears, or as you move through repeating arches, sensing the underlying pulse of architecture. Musicians will understand these symbols of embellishments. 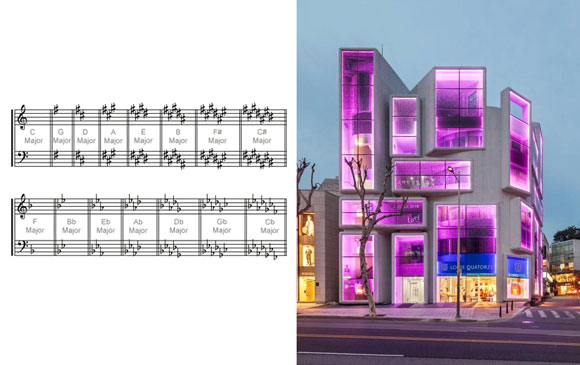 Over some of the notes written by the composer, he has added one of these well-known symbols that says, “Go ahead: Add a few more notes to make it sound really cool!” Take for example the corner of a building. The architect has also added a few more notes. And whether the final result is Classical or Modern, it is certainly cool. 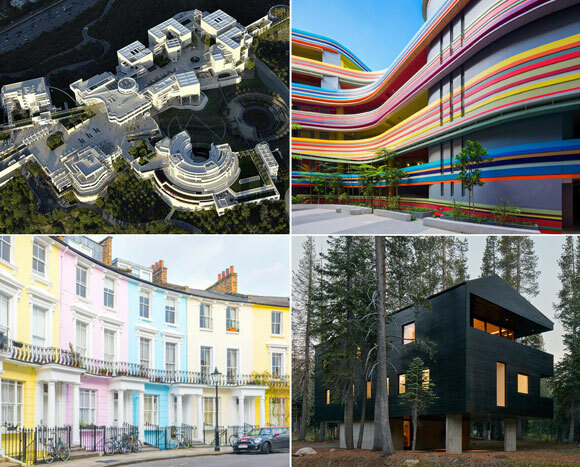 Color is an obvious attribute of architecture. For non-musicians, the idea of color in music is unknown. Composers and performers alike understand that the key of the music is like color in the visual arts. In music, key is an assembly of pitches that becomes the framework of the piece. There are 12 major and 12 minor keys, and each one has very different experience. Similarly, a house painted in beige has a very different personality when painted in purple. As with color, gravity is obvious in architecture. It is a rule that we cannot alter. Gravity is omnipresent doing its job keeping buildings grounded to the earth. Working with our structural engineers, architects make sure that gravity doesn’t win—that the roof we put over your head will not collapse. But what is gravity in music? Answer: meter. 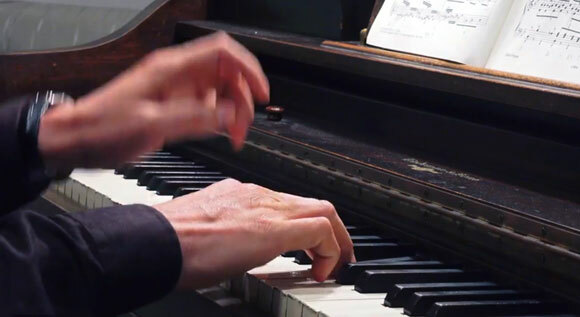 Akin to gravity, the meter is the structure underlying every note that is played. Whether the typical pop song of four beats per measure, or a waltz of three beats per measure, once decided, the meter does not typically change. These musical annotations instruct the performer how soft or loud to play the music, also called the dynamics or volume. Architecture too has dynamics. From Minimal to Avant Garde, buildings can be mute or they can yell. The music score are the notes of the music. After mastering these notes, the performer brings her own interpretation to the score. 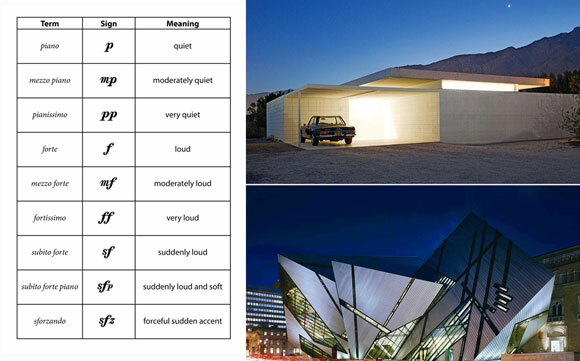 In architecture, a building is like a score. With a museum, the architecture is the framework, the score, for the museum’s curator to add the interpretation. 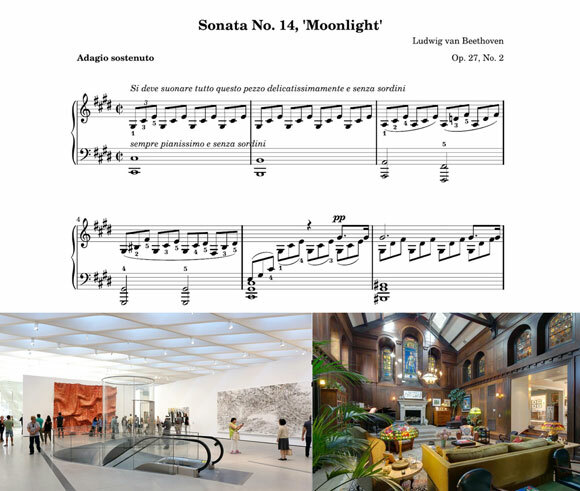 And with each new event, the result is different, as with each musician playing Beethoven’s Moonlight Sonata. In the church above, that architectural score has been re-read as a home. Lastly, does music exist if there isn’t a listener? 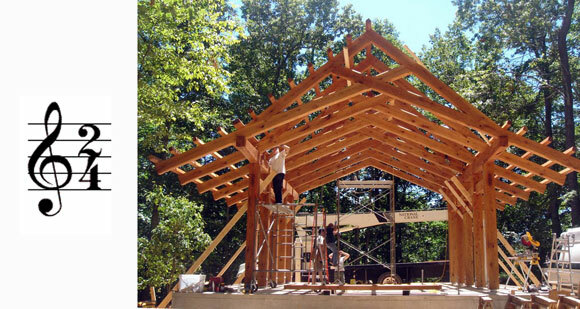 Is a structure called architecture if the building isn’t created for someone’s purpose? 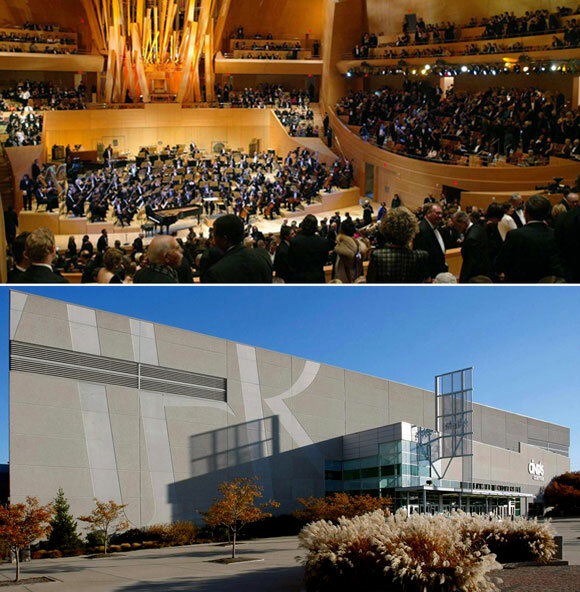 Both music and architecture require an audience. There is size and scale to the audiences. Like the design of a basketball arena, there is the large audience listening to a symphony. 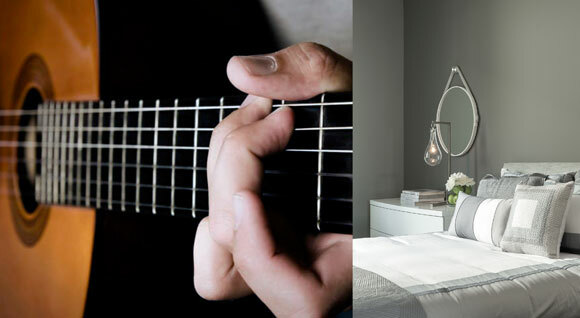 Like the design of a quiet bedroom, there is the intimate audience of one or two listening to a guitarist in his studio. Though only seven thoughts in seven minutes, my discussion on the two topics will continue into the future, as it has in the past over and over again . Suffice it to say, without music and architecture, there is no existence, no culture, no progress, no civilization.